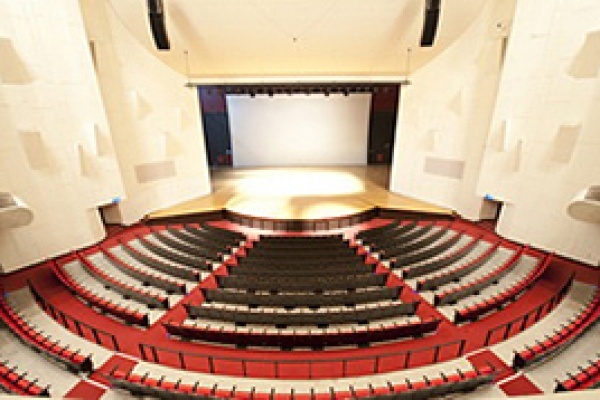 In the main body of the center, the Performance Hall is a three-floor building with 1803 seats in the fan-shape area. It provides a set of world-class sound, lighting and stage designs to accommodate a wide variety of traditional and modern arts performances. Right in front of the Performance Hall is a sculpture of phoenix, symbolizing eternity, surrounded by colorful cool fountains. At sunrise or sunset, rainbows are seen around. To the right, the sculpture “Departure and Return/ Return and Departure” looks like a reality or a fantasy. And a set of sculptures “From the Past to the Future” can be found by the fountain pond. These spots are always the favorite scenes that the tourists try to capture by taking picture.